Sitting in the heart of Collin County and home of the Collin County Courthouse, McKinney takes great effort in preserving its rich history while being one of the fastest-growing cities in the United States. It’s no wonder McKinney was named the Second Best Place to Live in America by Money Magazine in 2012, scoring highly for its beautiful natural parks and open spaces, affordable and diverse housing, plenty of jobs and a vibrant downtown that offers lots to do for residents. The Central Expressway (US 75) runs directly through McKinney, providing easy access to nearby cities, such as Dallas. Still within a reasonable commute to Dallas, McKinney avoids the big-city feel with spacious lands, green landscapes, and farmers markets even with a population estimated at 149,082. Families make up the largest demographic in this city that has four high schools and a host of elementary and middle schools, most within the McKinney Independent School District which was given an 8 out of 10 by Greatschools. 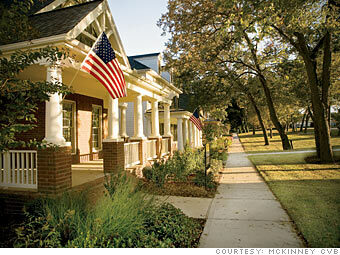 Mckinney is also home of the Central Park Campus of Collin College. The average temperature is around 64oF and the average rainfall is 42.3 inches. With the variety of housing available, and population on the rise, practically anyone can find the right place here.